Pictured: Hunter, age 3; Guini, age 2; Gavin, age 4; and baby Gemma, age 6 months. Thanks to Tredessa for snapping the shot, Steph for cheerleading the smiles out of the kids and Stormie for creating my "card" to you! 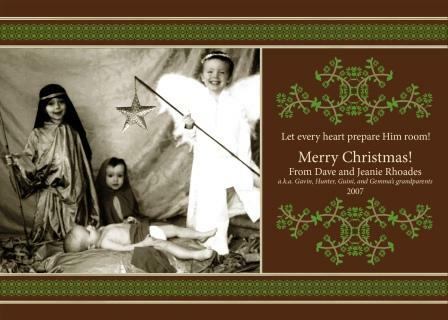 Your Christmas card is priceless. How did you get baby Gemma to lay still? How adorable. Just too cute! The best card yet! The kids are so adorable! How sweet… thank you for sharing the "joys" of your life. Merry Christmas!